The Fifth Annual Scott Kelby World Wide Photowalk was a whole week ago. With contest image submission approaching (Monday, October 22), I finally sat down to look at the photographs I brought back from our rainy walk in downtown Iowa City. Just for quick summary, this year there was 1339 walk with 31776 photographers registered for the event. Comparing to last year’s stats (I tend to post them each year), it was even bigger then before. You can see some of the group images of photo walker from all over the world on Scott Kelby’s Google+ page. All credit for this awesome event goes to Scott for coming up with this neat idea and to Bruce Thayer, always finding time to lead a photo walk in our neck of the woods! 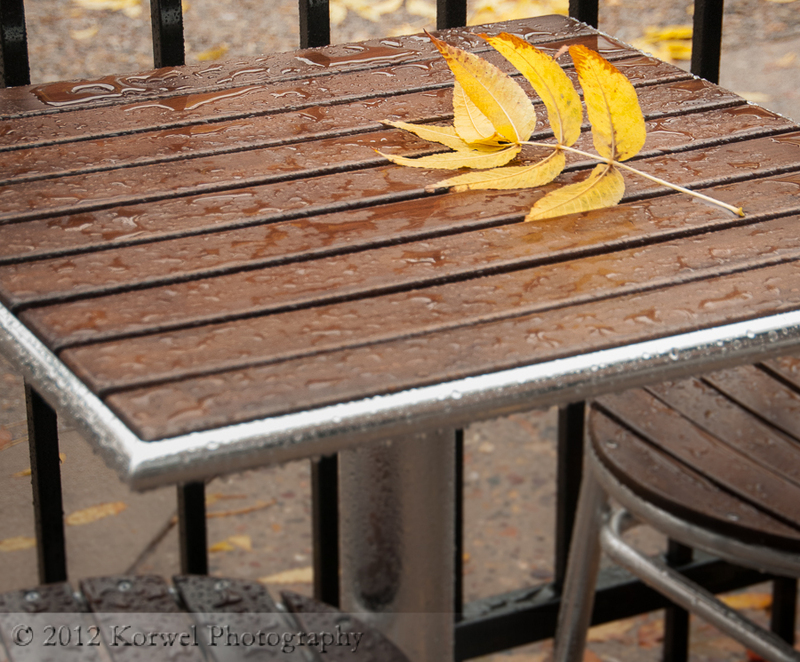 For my contest image entry, I picked this lone tree branch with some yellow leaves on the outside cafe table. For me, this image shows the reality of autumn hitting the town. The outside tables and chairs stand empty, in the rain, and nobody removes the leaves from them anymore, all forgotten until summer. UPDATE (October 24, 2012)- my image was selected the best image of the walk! Yay!